Scottish Water is building a 3.1 mile-long waste water tunnel in the south of Glasgow as part of the biggest upgrade of the city’s waste water network in more than a century. The Shieldhall Strategic Tunnel, which will run between Craigton and Queen’s Park area of Glasgow, forms part of a £250m, five-year programme of work to upgrade the waste water network in the Greater Glasgow area. The scheme is the biggest investment in Glasgow’s waste water network since Victorian times and is designed to handle increased rainwater flows and improve water quality in the River Clyde and its tributaries. Groundforce Bridge was subcontracted to Costain Vinci JV (a joint venture of Costain and Vinci Construction Grands Projects) together with Groundforce’s shorco division, who supplied a temporary works excavations support system for a 190m section of the tunnel construction. As one of the UK’s leading specialists in the hire of temporary works equipment, Groundforce Bridge was able to offer the Costain Vinci JV a turnkey service which involved the supply of a bespoke designed temporary bridge to span the open excavation. Two months after installation of the trench support system, Groundforce Bridge supplied an 8m x 1.6 m modular bridges, which followed the line of an existing footpath that provides access to a pedestrian underpass underneath the adjacent M8 motorway. The bridge, which is part of an extensive range of temporary bridges, is equipped as standard, with a non-slip surface and safety rails, and can accommodate a maximum load capacity of 5 kN per square metre. As an additional safety consideration for its personnel, the contractor requested the pedestrian bridge be fitted with a roof. 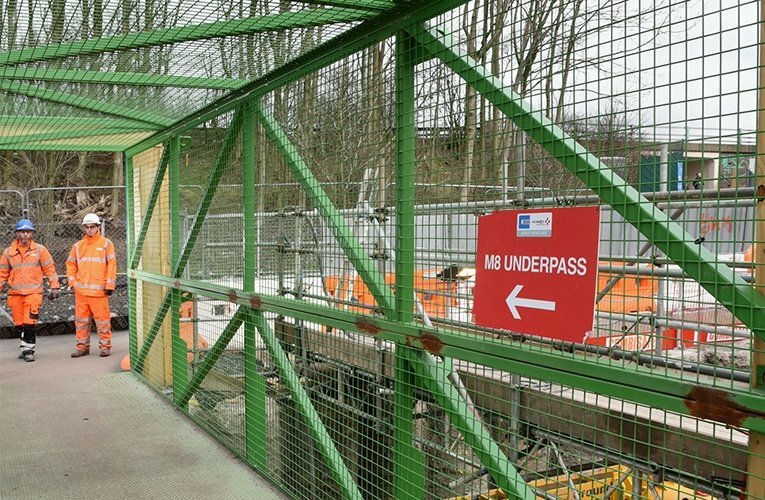 Groundforce Bridge were able to meet this requirement by adding a bespoke designed protective canopy to the bridge. A key benefit of Groundforce’s temporary bridges is they are extremely quick and easy to install, typically this 8m x 1.6m bridge can be installed in under an hour and by a team of 2 people, even with the additional canopy the bridge was installed in less than 2 hours. Groundforce Bridge offers an extensive range of temporary bridging solutions tailored to the requirements of the construction, transmission, rail and events industries and with a highly experienced engineering team, Groundforce can supply tailor made solutions. Its products comprise a range of modular flat-pack bridges ranging from the Mini Bridge, a 3.0m wide design which spans up to 4.5m and will carry loads up to 44 tonnes, to the lightweight Pedestrian Bridge spanning up to 6.0m, the Midi and Maxi Bridge with a span of 5.25m and 8.0m, and finally the Mega Bridge with a span of 10.6m. All models conform to all current regulatory requirements.